Bionic Steel Hose Reviews - Is it a Scam or Legit? Bionic Steel Hose claims its two-layer design, ultra-strong fittings, and stainless steel outer housing can deliver better performance than other garden hoses. What is Bionic Steel Hose? Featuring a pressure resistant inner lining and a flexible, puncture proof, stainless steel outer housing, Bionic Steel Hose promises to deliver super-tough performance, avoid cracking in the sun, deter corrosion and rust, and to be more durable than any standard garden hose. In fact, the commercial shows Bionic Steel Hose working perfectly after being dragged through sharp objects, grinded with a power tool, frozen in a block of ice, and even set on fire. Despite its tough metal coating, though, we’re told that Bionic Steel weighs less than three pounds and its compact, patented design will never twist, tangle, or kink, so it’s perfect for homeowners and professionals alike. But is the Bionic Steel Hose worth the money? Are there any other competing products? Is it really indestructible? Let’s kick things off by taking a look at the competition. Is Bionic Steel Hose a Unique Product and Is There Any Customer Feedback? Is Bionic Steel Hose swimming in competition? Not at the time of our research. However, we recently wrote an article about Flex Steel Hose. And based on what we can tell (we didn’t test either product firsthand), it and Bionic Steel appear to be identical in every meaningful respect. What’s going on here? Over there years, the HighYa team has reviewed more than 800 As Seen on TV products, and we’ve learned that it’s not uncommon for companies to ‘share’ products and sell them at the same time. Based on this overall lack of competition, we might be able to logically deduce one of two things: Either, 1) these stainless steel-wrapped hoses represent a legitimately revolutionary idea currently only offered by a couple of companies, or 2) no one else sells them because it’s a flawed concept. Unfortunately, without any online customer feedback, it’s impossible to realistically understand which way the situation is headed with Bionic Steel Hose. While we're not told exactly who it is, it appears that Bionic Steel's manufacturer also makes Forever Comfy, a foam seat cushion. Overall, customers seemed to give it a middle-of-the-road rating; some were pleased with its performance, while others complained it didn't live up to its promises. With this said, it’s important to note two things: First, since this is a completely different product, so we’re certainly not saying you can expect the same with Bionic Steel Hose. Second, this is the most common complaint among all ASOTV products, not just those from Bionic Steel’s manufacturer. Now, how does Bionic Steel compare to Flex Steel from a price perspective? How Much Does Bionic Steel Hose Cost? The 25' Bionic Steel Hose is priced at $19.95 plus $6.95 S&H. You can order a second during checkout for an additional $6.95 fee. Not unsurprisingly, Flex Steel is priced similarly at $19.99 plus $7.99 S&H. Flex Steel is also available in 50', 75', and 100' lengths. According to the commercial, additional Bionic Steel Hose sizes are also available by calling customer service at 866-304-4271. We contacted support at this number twice, although both times we waited on hold 5+ minutes without anyone picking up, until we decided to disconnect the call. Regardless, all Bionic Steel Hoses come with a 30-day money back guarantee, less S&H. This is important to keep in mind if you plan on taking advantage of the BOGO offer. Whether online or lining the aisles of your local home improvement store come springtime, you’ll find that Bionic Steel (and its close competition) is priced similarly. But will Bionic Steel’s stainless steel exterior feasibly provide more value for the same amount of money? How Does Bionic Steel Hose Compare to Traditional Garden Hoses? Most consumer-grade garden hoses are constructed of vinyl, rubber, or a combination of the two (specifically, PVC). Pro tip: Safe water drinking hoses (aka fresh water hoses) are typically made with nickel or plastic fittings and constructed of medical-grade vinyl. Bionic Steel Hose doesn’t claim to meet these criteria, so don’t plan on taking a sip on a hot day this summer. Higher-end rubber hoses usually feature embedded nylon or polyester cord for reinforcement. Because of this, as well as their thickness, they’re durable and not very prone to kinking or puncturing caused by everyday use. However, they’re heavy and need to be kept away from UV exposure. Vinyl hoses, on the other hand, are often lighter and less expensive, although they’re easiest to puncture and have a tendency to kink. Given Bionic Steel’s construction, it certainly seems to address the kinking issue. Will it provide more durability, though? First, whether stainless steel, rubber, or vinyl (especially if reinforced), you can freeze pretty much any hose in water and still have it work—as long as there’s not frozen water inside the hose, either. Second, grazing a regular garden hose (again, especially one that’s reinforced) with a power grinder in a light, side-to-side motion probably wouldn’t puncture it, either. Obviously, this isn’t something you’d want to do on a regular basis, but for demonstration purposes, we don’t think this stunt in the Bionic Steel commercial necessarily amounts to anything more than ASOTV showmanship. Finally, BobVila.com tells us that even the least expensive traditional garden hoses feature two-layer designs, while upper-end models feature six. So it doesn’t seem like Bionic’s two-layer construction (an inner lining and metal shell) is necessarily unique. In fact, without this inner lining, it seems like Bionic Steel’s linked metal shell would quickly leak water. More than anything then, this lining appears to be more of a functional necessity than a real-world benefit. In the end, what does all of this mean for you? Is Bionic Steel the Six Million Dollar Hose? When it comes to Bionic Steel Hose, what are we looking at here? Is this some marvelous feat of engineering, accomplished only by the greatest minds in consumer products? Or, is this some half-baked idea that a couple of companies are using as guinea pigs to test consumer demand? Again, we can't know since we didn't test it. However, if it comes down to a choice between Bionic Steel and Flex Steel, the former comes with less expensive shipping charges, while the latter features a longer 60-day refund policy. Either way, though, keep in mind that your original S&H charges (as well as whatever it costs you to ship them back) aren’t refundable if you process a return. Just remember that, like us, you might experience some difficulty reaching customer service. Before you go, tell us about your decision regarding Bionic Steel Hose. Did you make the right choice, or did it fail miserably? Give us some insight below in your review. I bought a 25" first in 2017 and got the second with the first order - one for the front and other for the back of the house. The second order was for a 50" and I still use the two together in the back to wash the car, etc. Not reading info, DO NOT leave the hose turned on over a long period or it will burst on the end from pressure. My fault! I just replaced the burst one this September. I was and am still happy with the performance and handling of this product! Worst hose I ever bought. Will never buy it again. Worst experience I had with a hose. It does not live up to its name. It was a wasted money and time. It's going in the trash. I will not recommend it to anybody. It leaks like crazy. I only had it for a few months. I purchased the 50-foot Bionic Steel hose so I could reach our flower bed and a little garden, with hopes that it would be easier than dragging a regular water hose back and forth, and at 72, it has been hard to do that every day. The first few times I used it, it worked really good. Then I took it off the hose reel and cut the water on, and it was like I had stabbed a knife in it. It leaked so bad I could no longer use it. I called customer service, and they told me I was out of luck since I didn't keep the original receipt. I had a copy, but no longer the original. I blew $38, and I will never do that again. So now, I'll wrap this shiny new hose up, put it in a bag along with the receipt and throw it in a corner or my shop as a reminder that being old is no fun and expensive! 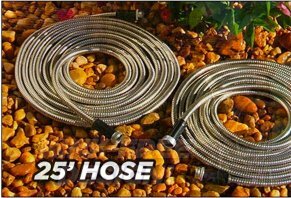 I purchased the 100-foot Bionic Steel heavy duty steel garden hose in November 2017 and placed in a hose container under the eaves of my home so it stays protected from the elements and was initially very pleased with the product. Very lightweight and easily stored. I used to hand water my flower pots and garden and some parts of my lawn. Then June 2018 it started to leak about thirty or so inches from the water spigot, which is weird because it is the other parts of the hose which would scrape on our deck or around wooden posts. I like the concept, but the product did not stand up to its claims. Not worth it. Waste of money. I do have to say, I like the idea that they are light and easy to move around and roll up when finished but, we bought this 50-foot hose last year and followed all the instructions and when I hooked up this year it leaked terribly in the middle of the hose. Since it doesn’t produce much water flow in the first place, it had no water flow at all with the leak! So since there’s only a 30-day money back guarantee, it’s now on the trash can! I have purchased three of the hoses, and two of the three have created holes in them. They are great hoses as far as flexible, but they just don't last without holes created in them. I would not purchase anymore because of those weak hoses inside the flexible steel outer cover. I would not purchase this hose. It can’t be used with an oscillating sprinkler because it puts out no water pressure. I bought it because of the no kink, and it hasn’t kinked, but the main purpose I bought it for was to water using sprinklers, and it doesn’t do the job. Very disappointed. The hose came apart after two uses. Horrible quality, waste of money. The company won’t honor the warranty. Do NOT buy! Also, the fittings are so cheap and flimsy, and there’s no way they would last. Of course, that doesn’t matter because the hose itself won’t last either. I am very disappointed in wasting my money. I just received my 100' Bionic Steel garden hose. I followed the directions and used it. What they advertise is true. It did not kink and rolled up very easily. But the hose is skinny for a hose, low pressure. I bought two of these hoses on May 31, 2017. I live in Canada and do not water my lawn, only my flowers. We have summer from June to September. I went to check my hose this year, and it has two leaks. I tried getting in touch with the company and left my number and no reply. I am not happy with this hose. I bought from the TV ad the Bionic Hose and believed that the 100-foot hose would be to my benefit. After receiving the hose and using it, I get very little water pressure, hardly enough to spray the soap off my washed car. I called the 866# for Bionic Steel Hose and the person wondered if I wanted to replace the hose. I was told I would have to pay to send the hose back. I asked her if she had any other complaints as to the problem I was having and she said she had heard this before. I said I doubted that a different hose would be any better and then why would I pay more to have the same problem. She then said I could call Corporate to see if they would help me and she gave me a number (800 432-4248), which when I called they were a health survey line for seniors and just a recording. I am not very happy with being ripped of. Do not buy this hose! I also have a leaky Bionic Hose. The number on my brochure is 1-800-423-4248. In your review you have the numbers 432 instead of 423, perhaps that's why you were connected to the wrong place. Write a Review for Bionic Steel Hose!